LAPD has an important message for you! Image of Robbery suspect wanted. Recently several Korean owned businesses, along Western between Olympic and Wilshire have been targeted by this robbery suspect. The crimes have occurred in the afternoon and evening hours. DANGEROUS. 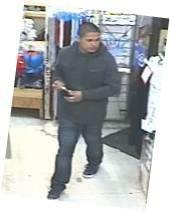 If you have information please contact Detective Corona or any Olympic Robbery Detective, at (213) 382-9460. During weekends or after hours, contact the Olympic Watch Commander at (213) 382 9103.